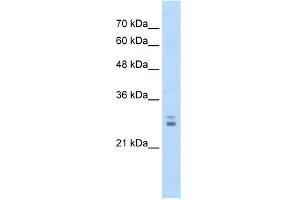 Characteristics This is a rabbit polyclonal antibody against KCTD11. It was validated on Western Blot using a cell lysate as a positive control. Background The KCTD11 gene encodes a protein that has been identified as a suppressor of Hedgehog signaling. Its inactivation might lead to a deregulation of the tumor-promoting Hedgehog pathway in medulloblastoma.